If at first you don’t succeed, try and try again. Fifth in last year’s Gr.2 Betting World 1900, Silvano’s son Elusive Silva made no mistake this time round and overcame the extreme outside draw to redeem himself in fine style. Racing amongst the backmarkers early on, jockey Bernard Fayd’Herbe switched the chestnut to the centre for his challenge in the Greyville straight and took the lead a furlong out. Although the favourite Dark Moon Rising came bounding from the pack, the visitor had the race in the bag and ran on strongly to score by a cosy half length. This first Gr.2 win, his sixth win overall, no doubt enhanced Elusive Silva’s prospects of another crack at the Durban July, a race he was quietly fancied for last year following victories in all of the Gr.3 Winter Derby, the Listed Sledgehammer and Gr.3 Cup Trial. However, his dreams of a July run were scuppered by a tendon injury suffered on the eve of the showpiece event. 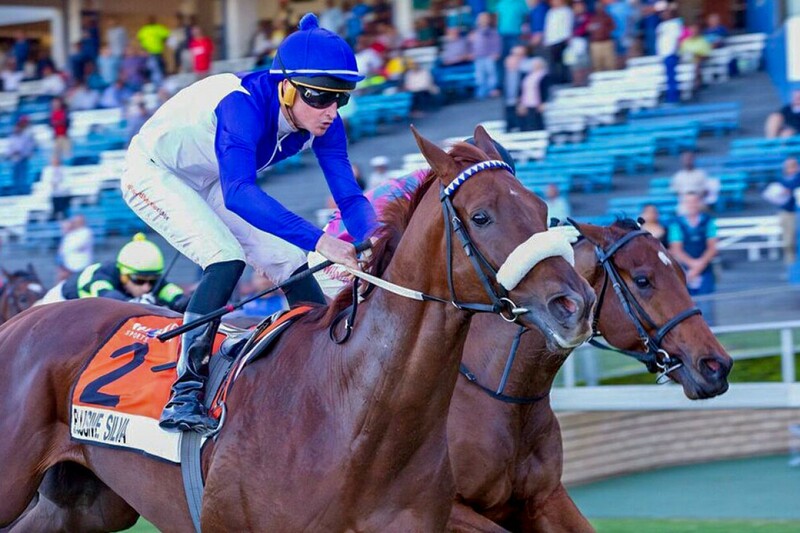 Trainer Justin Snaith elected to follow the same KZN campaign as last year and the five-year-old made his seasonal debut in defence of his Sledgehammer crown, running on steadily to finish fifth. That was a decent run and set him up perfectly for the 1900. Bred by Nutfield Stud, Elusive Silva is out of the Fort Wood mare Esprit, a winning own sister to champion racehorse and Gr.1 stallion Elusive Fort. Significantly, Elusive Silva initiated an impressive treble for sire Silvano, with talented mare Star Express landing the very next race and three-year-old Miyabi Gold coming home ahead of her field in the final event of the day.